This week, I have another fantasy novel, (I'm sure everyone's *super* surprised) Story Thieves, by James Riley. Life is boring when you live in the real world instead of starring in your own book series. Owen knows that better than anyone, what with the real world's homework and chores. But everything changes the day Owen sees the impossible happen--his classmate Bethany climbing out of a book in the library. It turns out Bethany's half fictional and has been searching every book she could find for her missing father, a fictional character. Bethany can't let anyone else learn her secret, so Owen makes her a deal: all she has to do is take him into a book in Owen's favorite Kiel Gnomenfoot series and he'll never say a word. Besides, visiting the book might help Bethany find her father . . .
Or it might just destroy the Kiel Gnomenfoot series, reveal Bethany's secret to the entire world, and force Owen to live out Kiel Gnomenfoot's final (very final) adventure. In this novel, James Riley perfectly weaves together reality and fantasy into a fast-paced, laugh-inducing tale that I could barely put down. I also adore the entire cast of characters in this novel, but I must admit that I am particularly partial to Kiel Gnomenfoot, who is always armed with both his wand knives, and a full arsenal of hilariously snarky comments. Owen gets to go on an adventure that I long to go on, and by reading about his journey, a feel a little bit like I've gone along with him. Not to mention the fact that Bethany is half fictional! Bethany has the power to jump in and out of books at her liking, which is, for lack of a better term, totally awesome! 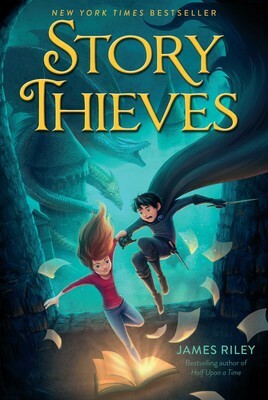 Story Thieves shows a new light onto the world of literature--that we're living in the non-fictional world, and there's a whole different dimension--the fictional world--out there where my favorite book characters are running wild, I wholeheartedly love this concept. One of my favorite books and series. James Riley delivers a memorable story and characters. Thanks for the reminder I need to read this again. Oh, yes, Kiel is definitely the best character! But Owen is so relatable, and Bethany is awesome! OK, I just love all the characters. This is a bookworm's dream come true. Great review as always! I had this book for a while and had a hard time getting into it, so I gave it to my great granddaughter. I like fantasy, but I never really gave this book a chance. Maybe I should borrow the book back, after reading your review. Love the cover! Yeah, I agree that the beginning does start off a little slow, but it definitely gets better as the story goes on.